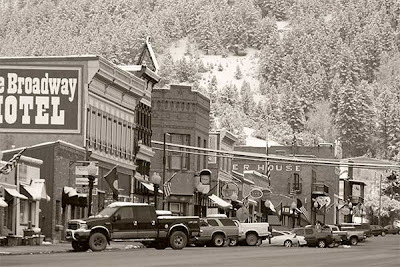 I obviously love a great many of Montana's cities and towns, but I'll confess to a particular fondness for Philipsburg. "P-burg" has a lovely setting, a fascinating history, and a fine assortment of historic buildings ... and only a handful of 21st-century intrusions to spoil the mood. How was the Conference? I think I would have enjoyed it. Read about it in Google Alerts. And the conference was quite good ... a few interesting papers, lots of connecting with old friends, and some very good tours. Got up to Fort Benton for a day, too, so I took lots of photos for the blog!